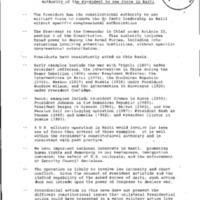 This collection contains materials from the White House staff office of the National Security Council (NSC), from 1994. 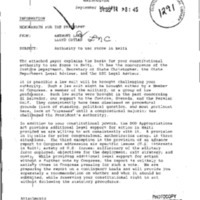 Records include correspondence, memoranda, newspaper articles, press releases, reports, and talking points. The majority of the materials are letters from President Clinton to various members of Congress. The President's letters are in response to congressional members whose original correspondence questioned the President's authority to use force without prior approval by Congress. Talking points explain the arguments for military intervention to various groups that the President met at the White House, including the Congressional Black Caucus, or to various news organizations and wire services. 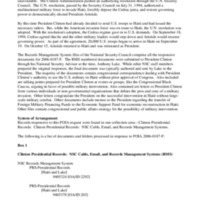 Reports include the justification of economic fund transfers in support of the reconstruction of Haiti, the public affairs strategy for possible military intervention, or the notification to Congress as required by the War Powers Resolution, when U.S. forces were deployed.